The empty Colorverse bottles have a unique design. Each bottle may come with residue ink and may not be the color depicted. The bottles are easy to clean with water or ammonia. The Colorverse 65ml Empty Ink Bottles usually ships within 1 business day unless otherwise specified. 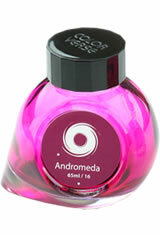 Each Colorverse 65ml Empty Ink Bottles we sell is guaranteed to be genuine, authentic and will arrive brand new & unused!